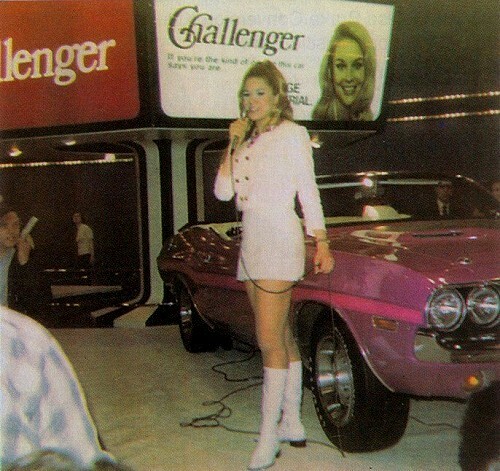 I've been searching for an original Panther Pink 1970 Challenger for quite a few years now. I setup my E-bay account to send me an e-mail whenever one was listed. Unforunately the e-mails I've been getting were almost always for diecast model cars. Then one lucky morning I received an e-mail showing listings for 2 of them! They were virtually identical. One was in Pennsylvania. The other in Texas. The one in Texas was rusted out pretty bad and had the quarter panels cut out of it. The one in Pennsylvania was in an accident 25 years previously and was missing the entire nose. Living in Vermont, it was a pretty easy decission as to which car I was going to bid on. And bid on it I did. So two weeks later I found myself traveling to PA with a rented truck and a borrowed trailer. Here she is (pink cars are all she's), ready to take off the trailer and store in the shop. As it always seems to be the case with bright colored cars, it was repainted in a much tamer color. The bottom picture is what it would have looked like back in 1970 minus the black longitudinal stripe, rally wheels and chrome remote mirror. Instead of going the R/T clone route, I decided that I would go for factory original. According to the broadcast sheet it had dual stripe white wall tires with "Challenger" hubcaps. It should look pretty interesting. NOTE: For the curious, the car in the bottom picture is actually a rare special order paint 1971 Challenger in Panther Pink. From this angle it looks the same as a 1970, but without the Challenger badging. 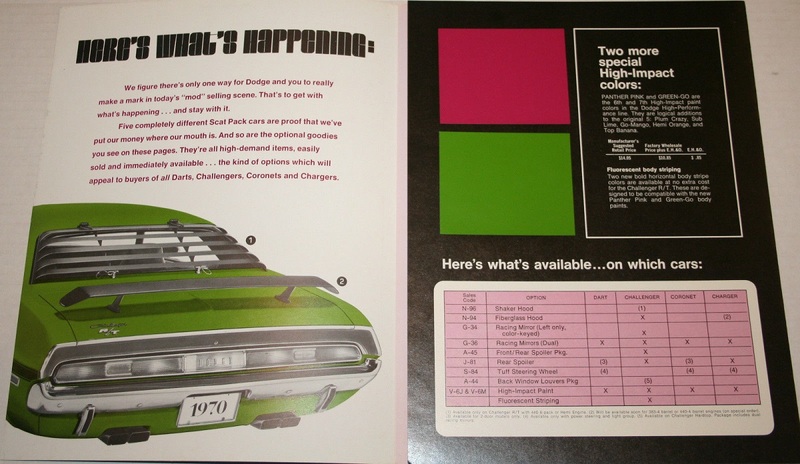 Panther Pink (Moulin Rouge) is one of 7 High-Impact Paint Colors (HIP Colors) that were available from Chrysler for the 1970 model year. Panther Pink along with Green-Go (Sassy Grass) were introduced in January 1970, usually refered to as "Spring Time Colors". The first car thought to be produced in this color was a 1970 Challenger R/T Convertible, which was produced for the 1970 Chicago Auto Show (Feb 21 - March 1, 1970). The show car was loaded with options which included a 440 Six-Pack engine, 4-spd manual trans and a fluorescent magenta longitudal stripe. The car was produced on Feb 11, 1970 and did not have a FM3 paint code, but rather a 999 special order paint code. 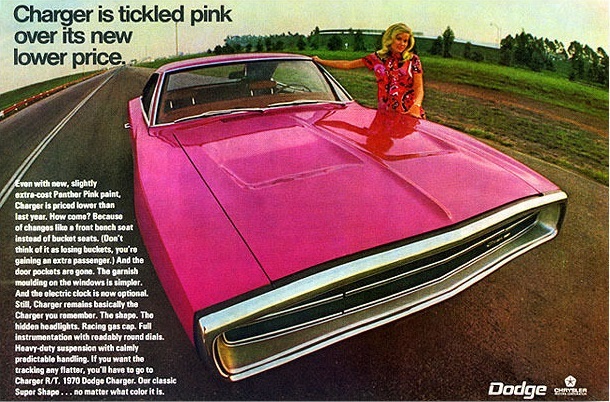 This is the only advertisment that appeared in magazines showing a car in Panther Pink. Green-Go cars did not appear in adverts. A recent discovery is this 1969 Super Bee, which was produced on January 2, 1969. The color has been confirmed, via reputable sources, to be Panther Pink. Though there is some contension as to whether it was produced by Chrysler as a trial for a spring-time color or was special order by a customer in this color as a happy coincidence. So, how many cars were produced in this color? Well, there is no clear answer to that. Infact there is no clear answer to how many cars were produced by Chrysler with any particular option or combination of options. That is because Chrysler only kept track of single options by percentage of total production. So when you hear some guy say, their car is 1 of 28 with a 440 or whatever. That's BS. Here are the actual percentages of High-Impact Colors produced for the 1970 model year (for the US only). You can see that 0.1% of all Challenger R/T's were Panther Pink. That's approximately 18 cars. Since 0.1% was a rounded figure, there could have been 0.05% - 0.14% produced in that color or 11 - 25 cars. Still pretty rare though. For non-R/Ts (like my car) there were somewhere between 255 and 299 produced. 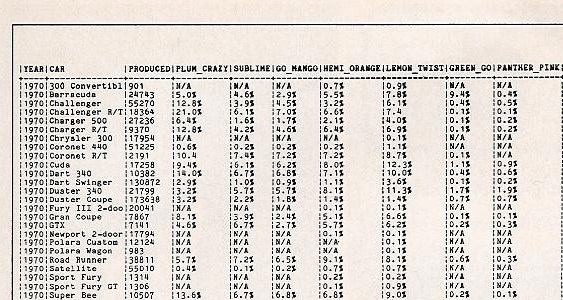 However, that figure included T/A Challengers. As of July 2017 there are 91 Panther Pink T/A's documented in the T/A registry. The registery contains roughly half of the T/A's produced. Therefore it is safe to say that less than 200 coupes like mine were produced in Panther Pink. Here's a more accurate breakdown of the Panther Pink cars for the curious. again, these are based on figures for the US Only.